Frank Dolman, one of UFV’s founding employees, passed away on August 18, 2011 at the age of 82. 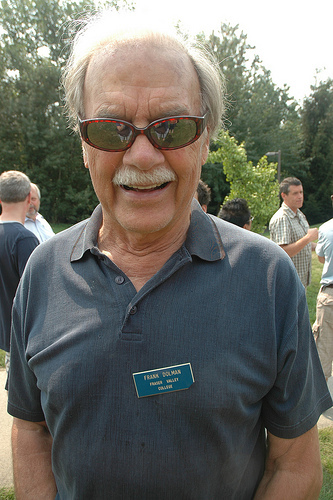 Frank was one of the four founding administrative employees of Fraser Valley College in 1974. The others were Eric Woodroff, Betty Urquhart, and Roy Craven, all of whom have also passed away. Bill Sharp was another founding employee, albeit a temporary one. He was seconded from the Abbotsford School District as the first bursar. Frank Dolman was director of adult education for the Mission School District in 1974. He had moved out from the city a year earlier, having heard a tip from his friend Bill Day (president of Douglas College) that a college was in the works for the Fraser Valley. Even before the college was officially announced in April, 1974, Frank and others were working for the future college on an ad hoc basis, helping with a publicity campaign to convince community members to vote “yes” in a plebiscite held to determine whether taxpayers were willing to fund a college. Once the plebiscite passed with an 89 percent in favour vote and Education Minister Eileen Dailly proclaimed the college into existence on April 4, 1974, the huge challenge of launching an “instant college” by September began. The original four were assigned duties to help ensure a September launch. Betty Urquhart took on organizing, developing, and staffing a complement of university transfer courses. Her job was made somewhat easier through the cooperation of the already established Douglas College, which allowed the new FVC to use its curriculum in the first year, and recommended many of the faculty who were hired on an interim basis to teach in a night school format. Some of these initial faculty members, such as Dave Wyatt, Peter Slade, Astrid Stec, and Paul Herman (who arrived midway through in the first semester to replace someone else) stayed for decades. Roy Craven, although he did not stay with the college long, was instrumental in the development of Student Services, the admissions and registration system, and the first college calendar, as well as overseeing the Abbotsford general interest program. In June, Beryl Frederickson was hired to open the Hope office, and Val Edmundson for the Agassiz office. Eric Woodroff served as a general administrator along with bursar Bill Sharp, filling in the gap until the first principal, Dr. Larry Blake, arrived in October. The first Fraser Valley College calendar lists programs such as College Foundations 1 (Grade 10 equivalency), College Foundations 2 (Grade 12 equivalency), and a variety of university transfer courses in subjects such as anthropology, French, literature, mathematics, economics, physics, history, psychology, biology, communications, philosophy, geography, sociology, and chemistry. There was also BTSD (Basic Training and Skills Development), pre-apprenticeship programs, upgrading programs, and trades qualification programs, as well as continuing education general studies courses. 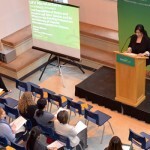 As one way of generating programming, Fraser Valley College took over continuing education (then also known as ‘night school’) courses in the region, which had previously been the responsibility of individual school districts. Frank Dolman was initially charged with the task of organizing the career/vocational programming, and operating the Mission office. Eventually he moved over to continuing education, taking charge of all part-time vocational programming, as well as overseeing CE in the western region. He remembers the frenzied build up to the college launch in 1974, and the first few years afterwards, as busy times. While wearing the career/vocational hat, Frank launched programs such as farrier training and welding. For farrier training (horseshoeing) the students went where the horses were. Bob Marshall, whom Frank hired from England to teach the program, would bring his students to host farms and stables. Eventually this led to the program moving into Kwantlen College’s jurisdiction since so much of the equine industry is based in Langley. As for welding, Frank knew there was demand for a program, but the new college had no facilities. Walter Bissky was the prison welding instructor, and eventually moved over to become one of FVC’s first trades instructors. Frank eventually moved from career vocational programming to continuing education’s part-time vocational section. Frank enjoyed his time in continuing education. In those days continuing education planners were open to almost any course that sounded like it might attract students or serve a community need. He was open to requests from industry too. “One time I was golfing in Chilliwack and a fellow came up to me and said his company would love to have a course in hydraulics and fluidics put on in Boston Bar, that it was too expensive to send millwrights to the city to take it. I told him that if he could find me a dozen students he’d put it on. So he went to the various other mills, including some from Lillooet, and recruited. So we ended up with a two-day-a-week course for them close to home for a month. Perhaps the most unique legacy Frank created was a Fraser Valley symphony orchestra. Frank recalls that in the early years, before the Marshall Road and eventually King Road campuses were established, the college could be a hard sell in the western end of the valley. Frank was born in Nakusp and spent his earlier years logging (he started out at age 15 and was one of the last of the manual cross cut saw fallers) a sawmill manager at age 21 as well as a bona-fide cowboy. After university, Frank worked most of his life in the field of education, first as a teacher and then in the field of Continuing and Adult Education; in 1973 being one of the first permanent employees of the then soon-to-be-formed Fraser Valley College, and then, one of a group who became leaders in the establishment of what is now the University of the Fraser Valley. Frank was a very enthusiastic member of the Hole in the Wall club, and many other organizations. He was a participant of the “Dirty Dozen” golf group (mostly Hole in the Wall members), which golfed for years at the Chilliwack Golf & Country Club. Frank was also very musical: he was a Member of the Vancouver Welsh Men’s Choir for more than 15 years, and had an over 20-year involvement with the Fraser Valley Musical Theatre Guild. Hi Ian, we’d love to talk to you about him. The slim history booklet he wrote on FVC early days is very valuable to us.